Andy Peaks was delighted to see AFC Rushden & Diamonds finish their season on a winning note - even if it wasn’t quite enough to clinch the title. Top scorer Ben Farrell’s first-half penalty was enough to secure a fifth win in a row for Diamonds in front of a bumper crowd of 978 at Hayden Road on Saturday. However, it was Beaconsfield Town who clinched the crown in the Evo-Stik South League East as they also claimed a 1-0 success at Marlow to finish a point clear of Peaks’ men at the summit. 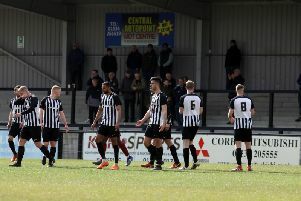 The main aim for Diamonds had been to seal one of the two automatic promotion places, something that was achieved thanks to the 7-1 demolition of Aylesbury FC last Tuesday. And even though they were denied the title, Peaks was pleased his team ended a fine campaign on a high. “At the end of the day, we achieved what we set out at to do at the start of the season and that was to gain promotion,” the Diamonds boss said. “We wanted to finish things on a good note and for me, it was paramount that we won that last game. “I thought we played very well in the first half and it was possibly a bit flat after half-time and that may well have been because people knew how Beaconsfield were getting on. Peaks, meanwhile, paid tribute to his players following the completion of an outstanding campaign. The celebrations went on long into the night after the final game of the season and the Diamonds boss firmly believes his squad got everything they deserved for their efforts. “We had a fantastic celebration,” he added. “It was a bit of an anticlimax at the end in that we didn’t win the league. “But we certainly enjoyed ourselves after the game and on Saturday evening. “I am just really happy for all the people behind the scenes at the club and for the players.